These one-of-a-kind earrings are fun, bright, and lively. 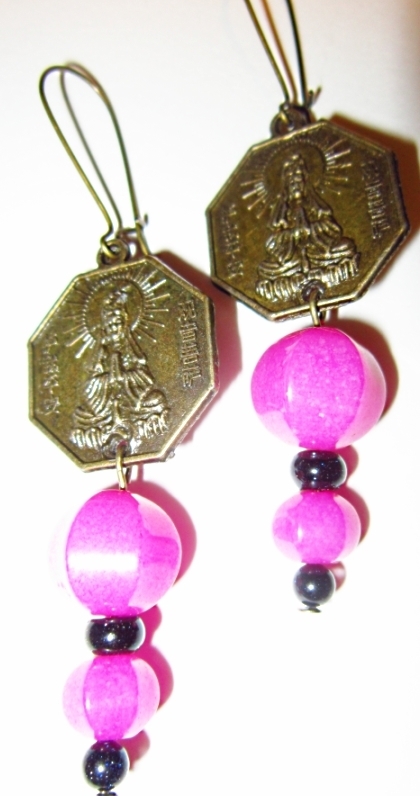 They feature two sided antique bronze Kwan Yin (Guanyin, Kuan Yin) charms with pink jade and blue goldstone dangles. Kwan Yin is the Bodhisattva of compassion and is believed to hear the cries of the world; on the back of this quarter-sized piece is the yin yang symbol. The deep midnight blue goldstone looks almost black, and its flecks of copper bring even more movement and glamour to these eye-catching earrings. These look amazing with hot pink, black, and white accents. According to BestCrystals.com, Pink jade promotes,"Harmony, peace, fidelity, confidence [and is] a wonderful dream stone," which I think is fitting paired with Kwan Yin. 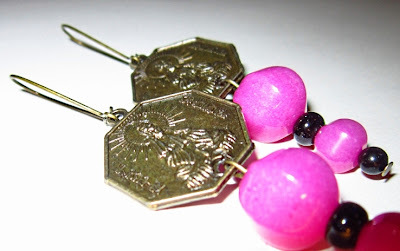 These moderate weight earrings are 3 1/8" long total. The charms and dangles measure 2 1/8" alone. Get them here on Etsy! These earrings were inspired by The Rachel necklace! Read about it here and buy the necklace here.